Concerns about the failing nuclear reactors in Japan and the fear of spreading radiation inspired me to share one of my favorite maps. The map shows areas in the United States crossed by two or more radioactive clouds during the era of nuclear testing (1951-1962) in the American Southwest. Click on the map for a larger version. Richard Miller painstakingly created his map showing where humans, animals, and the environment were contaminated by radioactive fallout, broadly dispersed by weather patterns. A sublime map, both beautiful and terrifying. The map is also reproduced in my forthcoming book, Making Maps, 2nd Edition (due any day now). 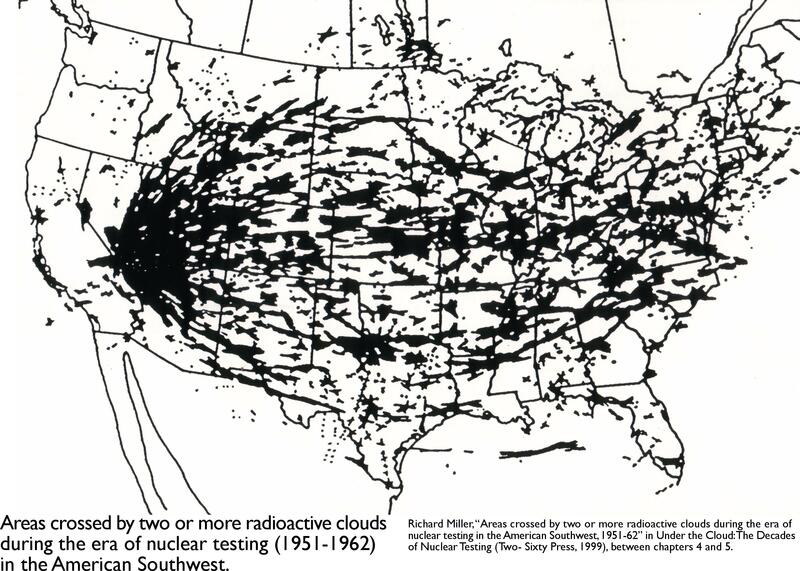 Source: Richard Miller, “Areas crossed by two or more radioactive clouds during the era of nuclear testing in the American Southwest, 1951-62” in Under the Cloud: The Decades of Nuclear Testing (Two-Sixty Press, 1999), between chapters 4 and 5. Tsk, tsk, tsk. Don’t worry, it’s just like getting a chest x-ray,,,, over and over and over again.